Nebraska Memorial Stadium is located on the campus of the University of Nebraska, just north of downtown Lincoln. 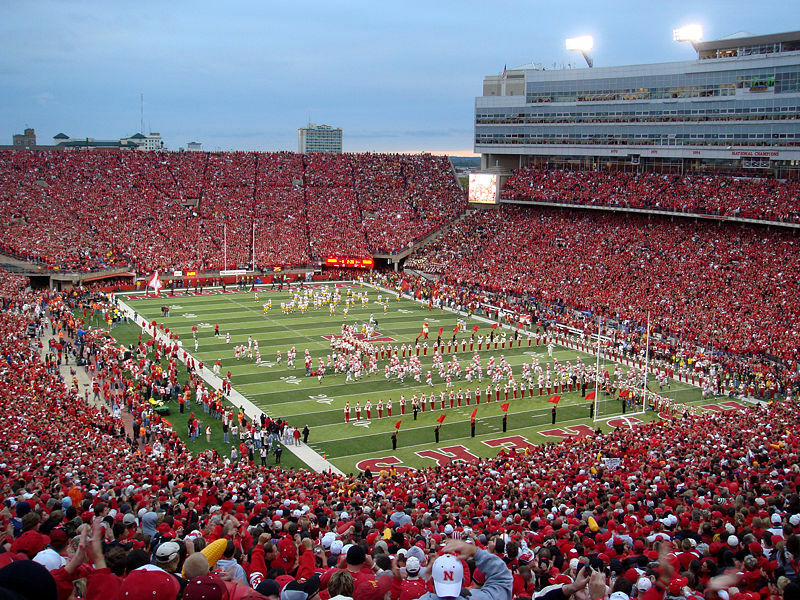 Memorial Stadium is the home of the Nebraska Cornhuskers football team. The stadium holds an ongoing NCAA record of over 340 consecutive sellout crowds which began in 1962. Capacity of Memorial Stadium is 81,067. Because most fans wear red apparel, the stadium is often referred to as the Sea of Red on game days. In the fall of 1922, a drive for funds to build a new football stadium was undertaken by faculty, students, alumni, and friends of the University of Nebraska. Construction was completed in just over 90 working days and Memorial Stadium was dedicated on October 20, 1923. Designed by John Latenser, Memorial Stadium was named to honor all Nebraskans who served in the Civil and Spanish-American Wars and the Nebraskans that died in World War I. Later, Memorial Stadium would also honor the Nebraskans who died in World War II, Korea, and Vietnam.